Corral Road was formerly known as Fraley Ferry Road. From the Baldwin County Courthouse, go west on Hancock Street for 2 blocks or 0.2 mile (or the one large block containing Georgia College & State Univ.). Turn right on Clarke Street. Go one large block or 0.2 mile. Turn left onto Business Highway 441 North (Montgomery St.) and follow the signs for Business 441 N (turn right on North Columbia St.). Go approximately 7-1/2 miles on 441N. Turn right on Corral Rd and go 1.0 mile. Park and walk 0.2 mile into the woods on the right side of Corral Road, following an ATV trail. The cemetery will be 180 feet to the left of the ATV trail. 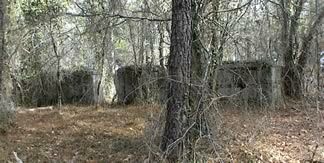 This cemetery was a stone wall enclosure approximately 30 X 30 feet. An expert believes it to be at least 100 years and likely 150 or more. It is about 4 1/2 feet tall, 18 inches thick with beveled capstone. Some of the wall has fallen. The mortar appears to have been lime and clay, and trees have grown into portions. 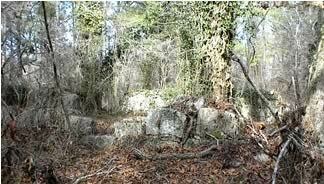 Some stones have been moved to a nearby abandoned and collapsed houseplace or elsewhere in the woods. Holes in the gateway suggest there was an iron gate. No marked graves.